In this article, I suggest two frameworks to acknowledge the past in Mexico during the War on Drugs (2006–). When President Calderón Hinojosa (2006–2012) and his successor Peña Nieto (2012–2018) militarized public security forces, the perpetuation of violence became the latest symptom of state practices undermining accountability. By using media and the national archives, the state has operated within a framework of conservation. It performed indirect censorship by spending millions of dollars on government publicity, fostering a media dependence on state income, and it also fulfilled a normative to protect personal data from historical documents and their access. If the archive exists at the core of memory institutions, such as museums or national archives, it is disseminated through conservation practices that have two functions: to uphold the truth, and to play a role in nurturing identity within the national project. Therefore, conservation occurs when curating and protecting the archive and, indirectly, the state itself. I then address another framework that has been influenced by the international discourse on human rights. The use of alternative digital journalism in Mexico concerning news reports on collectives that search for their disappeared present these stories as a form of open archive. By granting spaces for remembering, the distribution of memory comes to exist within social media, news portals, and other non-formal means of circulation such as film festivals or international award competitions. As a result, the mediation achieved travels as a form of civic preservation, occurring outside memory institutions. Digital media can be used as a source of emancipation. As Milan (2015) points out, the years 2005–2015 indicate the era of transparency and social media activism. In Mexico, the emergence of a generation of news portals that shared that same ethos can be traced to these years, some of which I consider to be alternative to commercial media. Alternative media can be understood as participatory and critical in the sense that it seeks to provide critical media content which can contribute to societal transformation (Fuch and Sandoval, 2009). The public visibility of such content should ideally rely on independent income, but must also consider commercial financing in order to broaden their scope, where the participatory aim is to give opportunities to voicing social concerns, and more importantly, such visibility must be in regard to the role these media play in a context of capitalism. Therefore, the critical content it provides lies in ‘pointing at the unequal, dominative, and non-participatory character of contemporary society…’ that may lead media to assume the position of the oppressed (Fuch and Sandoval, 2009: 146). The goal of this article is therefore to discuss the moment in which such media became a form of collective memory of resistance1 parallel to the period of violence and lack of accountability from commercial media. The following precedents stand out in this regard. The first is the Neo-Zapatista uprising (1994) with the Medios Libres and the Indymedia grassroots movement during the alter-globalization demonstrations (1999–2005). This signified the first global movement against capitalism. By grasping the possibility of reinventing oneself through media interaction and connectivity, civic organizations of local influence gained international scope, fostered by the Internet. Largely regarded as a democratic turn during the neoliberal era, the people of Chiapas put forward their identity as a form of resistance against the NAFTA (North American Free Trade Agreement), and then later against the state.2 They sought dialogue not between peers or indigenous people alone, but more broadly with a civic, global crowd that also searched for a subjective voice in the hope of suppressing the utilitarian logic. Secondly, Bennett’s and Segerberg’s (2012) conception of connective action best describes the pro-democratic waves of protests from 2009–2013 in conjunction with the 2.0 web platforms and emergence of social media. As governments became more and more reliant on corporate surveillance, as the Edward Snowden revelations show (Milan, 2015), so did online networks. #YoSoy132 replicated the #Indignados in Spain, France, and other southern European countries spread by the protests that began in the Arab world. Citizens became media producers and news creators, and went from being accidental witnesses to media activists (Mortensen, 2011) and event creators. Therefore, they reinforced their subjectivity while seeking social change. Thirdly, the networked architecture of the Ayotzinapa case in 2014 became a global phenomenon, in light of the current state of macro-criminality, precisely because it benefitted from the previous media practices (and nodes) that the #YoSoy132 social movement left behind (Gutiérrez, 2015). Fourthly, the Movement for Peace with Justice and Dignity (2011) had given voice to the Movement of the Disappeared prior to that, creating a news agenda that was not part of the mainstream news; online alternative journalism soon picked it up (Gibler, 2017; Martínez, 2017; Quintana, 2017; Lorot, 2018), with independent journalists setting up their own portals and thereby making an indirect impact on the main media industry in which the transformation of news production unified amateur and professional media through social movements. This is what I refer to as a ‘civic framework of preservation’ that follows the trend of the human rights discourse. As I will show, the relevance of this emancipatory usage is that it seeks to contest several practices that the Mexican state has carried out for decades, either by conditioning commercial or mainstream media, or by other means that operate as a form of conservation that strives, ultimately, to forget. I want to clarify that the media’s potential for emancipation lies within its social usage. Which is to say that I do not refer to the Western narrative of media as a liberating and democratizing tool, as is often the ideological subtext when digital media plays an important role in the disturbance of authoritarian regimes.3 Instead I focus on how specific, current forms of communication are instruments that can disrupt order. It is within their usage that an array of possibilities emerge, as Frantz Fanon exemplified4 in A Dying Colonialism (1965). Fanon argues that social transformation lies within the technological usage of the tool, not in the tool itself. Media inaugurates new forms of memories, which, as Jodelet (1993) explains, refer to the result of communication practices and social and technological evolution that comes to constitute what she calls ‘mass memory’. Mass memory activates emotions, which are important assets for providing identification and unification. In turn, memory, knowledge, and emotion go hand-in-hand with the mass phenomena of presenting content in such a way that it transcends collective memories or the collectivities involved. As a result, the social character of memory is constructed and in turn becomes the very content of public memory. But what kind of public memory is achieved if for many years there have been no clear-cut boundaries between mainstream media and the state? Largely exposed by many scholars and organisations such as Article 19, the state of the media in Mexico is, to say the least, disconcerting. Most organizations which were and still are the most dominant television network enterprises in Latin America—from the foundation of Televisa and later TV Azteca to the small, current news media platforms found online—all have a constant: a lack of sufficient, independent income sources (Artículo 19 Oficina para México y Centroamérica, 2016). Media rely largely on governmental funds that are disguised as official publicity. Therefore, this relationship is considered to be a political patronage to media organizations. Needless to say, if critical content is broadcasted, the government can intimidate or corrupt the media because it conditions news organizations by threatening their income. It is true that during the analogue era these practices were far more severe than now, but that does not mean that they are gone altogether. On the contrary, with all the plurality it represents, the online world is still very much intimidated by this scheme to this day, and worse, not only by the Institutional Revolutionary Party (PRI), but by a dozen more of recent creation. As a result, political parties participate in the media, co-opting it (Guerrero, 2016). The latest example in this regard is the usage of bots in Twitter and Facebook, as well as the unfolding scandal of Cambridge Analytica, with which, through a third party, political organizations have managed to sway the media. While this case evidences the influence of locally-used technologies to shape affections, as well as how they character political and social frames on a macro-scale, behind lies a power structure interested in keeping its privileges. What is novel here is that through these transnational corporations, propaganda and manipulation comes from global organizations, not just national actors. Indeed, state-sponsored content must be understood as undercover censorship. That is the first action that can be interpreted as a form of conservation because the state gains power over most mainstream media by controlling its income and therefore by eliminating freedom of speech and neutrality. It is important to point out that if corporations like Televisa cannot resist the conditions of their biggest client—the government—then smaller media organizations that are struggling to survive will face the same challenge under worse conditions. While sources of income to raise media’s independence are not inexistent as such, they remain insufficient, and therefore critical and media representing plural points of view become more of an exception than a rule. Historically, media has also been an ally to those in power. According to Article 19, when digital media formats first emerged, the corresponding taxes were inferior to what was required, and many radio concessions were also provided for in exchange for silence (Artículo 19 Oficina para México y Centroamérica, 2018). When trusting these concessions to the hands of few but extremely powerful families (10 families own 70% of the country’s private radio stations), frequencies for community radios were excluded. Therefore, both the main media corporations and emerging new ones have reaped the benefits of the marketing of democracy, reconfiguring new forms of control in the digital sphere. As a result, journalistic practices that emerged from this symbiotic relationship did not ‘create investigative journalism based on data, or on an evaluation of public policies, or government programs, public expenses, nor did they try to build a public agenda apart from that of the discourse and conflicts of the political elite’ (Guerrero, 2016: 58). This also explains the lack of social content within mainstream news organisations. Another example that illustrates the state operating under a logic of conservation is its use of historical archives. A recent law has enabled the state to anonymize the information of the Dirty War and any document related to enforced disappearances or other crimes committed in the past.5 The National General Archive has decided, under this criteria of protecting personal data, to safekeep the information of those involved. Therefore, by obeying the norm, the government promotes a recurrent violation of the right to information, assuming a political position over the right to truth (Ruelas, 2016), especially historical and state violence-related truth. And yet, Mexico holds international obligations for truth-seeking; the UN High Commissioner for Human Rights signed an agreement for the establishment of an office in 2002. However, since 2013, Mexico has denied entry to international experts following the cases of the disappeared, and currently, the overall assessment is one that indicates a deterioration of human rights (Resendiz, 2018). In their annual report, Article 19 confirmed that Peña Nieto’s administration had severely damaged the fundamental right to know, the right to access to public information, the right to truth, and the right to demand accountability from public servants. 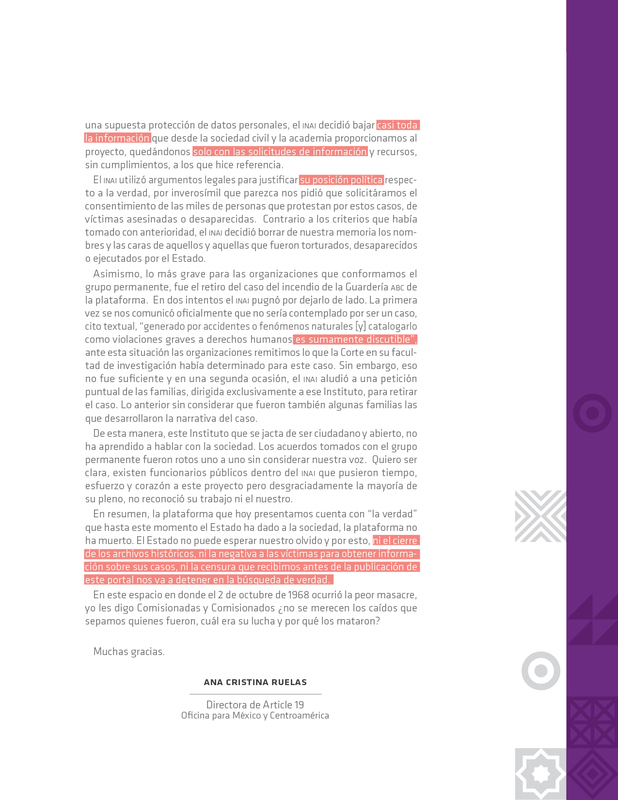 Furthermore, the organization accused Peña Nieto’s policies of having an open intention to censor (2017) (Artículo 19 Oficina para México y Centroamérica, 2018). If the past is unclear, we can expect the same for the present. According to the Interdisciplinary Group of Independent Experts (GIEI), who were appointed to follow the Ayotzinapa case, neither is the truth as a right, the right to remember and victims’ right to know, nor its compliance to any international standards of human rights anywhere to be seen in the Mexican law (Grupo Interdisciplinario de Expertos Independientes, 2017). In the case of the missing students from Ayotiznapa Normal School, this became evident because enforced disappearance is a crime that repeats itself, even after the internationalization of the cause that Comité Eureka pursued in the 1970s. Comité Eureka is a collective that was created after a wave of disappearances occurred simultaneously with the State of Terror practices during the Dirty War in the rural region of Guerrero, where enforced disappearances were also carried out. What Comité Eureka shows is that previous cases of enforced disappearances have all occurred during a democracy. As a nation in transition, what does Mexico do if it is already a liberal, democratic country? Little has changed with this political shift; PRI left the presidency after almost seven decades in power, and it is precisely within the two mandates of the opposition in command between 2000–2006 and 2006–2012 that the cases of disappearances aggravate, entering into the period known as the War on Drugs. If there is any doubt of this repetition, the United Nations Working Group on Enforced or Involuntary Disappearance provided a graph of the number of cases of enforced disappearances per year and per country between 1980 and 2016. Unlike other cases, in which disappearance is linked to a particular period, Mexico reveals a constant pattern throughout the years (Figure 1). Number of cases of enforced disappearance in Mexico per year between 1980 and May 2016. Source: United Nations Working Group on Enforced or Involuntary Disappearance. Human Rights Council, 36th session. A/HRC/36/39, p. 44. As mentioned, the political change also did very little to stop impunity. During the Vicente Fox administration (2000–2006), the Special Attorney for the Social and Political Movements of the Past was created to address the Dirty War. However, out of this process, 532 cases where taken in, including only two high-profile detentions that were later exonerated. To this day, the results have not been published and the attorney has ceased to exist. While it is helpful that the recent law on enforced disappearance includes non-state actors as perpetrators, opacity is still a constant even if international instruments play a key role in how the Mexican state conducts such enforced disappearances. Updating the repressive environment of the original enforced disappearances of the 1970s to the current, ambiguous, criminal environment (Mata, 2017, as cited in Yankelevich, 2017) has not resulted in better accountability; the sources of violence have multiplied from local gangs to cartels and all the illicit commercial activities involved. Besides, violence is not a matter of criminal activity alone. Violence is the cyclic outcome of impunity. Previously, it was the state that carried out detentions and disappearances against political opponents. Now, one must add actors who are involved in powerful illegal industries and state collusion (Mata, 2017, as cited in Yankelevich, 2017). It is in this regard that the state operates within a frame of conservation as well. On the one hand, conservation in a professional sense is a series of practices carried out to protect patrimonial or historical documents so that they survive the passage of time, usually in reference to their physical formats. However, with the recent law on archives, truth matters little, and what counts is history linked to a national project, even if this means being negligent because, as Rigney (2014) states, the nation as the traditional framework for collective memory reinforces itself through its institutions. Mexico extends the usage of the archive to a Western and Mestizo modern state ideal, neglecting the original populations. A form of internal colonialism (González, 1965) can be read by linking the original diversity to the dominated. This is the only possible reading for denying the value of finding truth in the Dirty War, for example, which had mostly indigenous communities in Guerrero as subjects to enforced disappearances. Even if by the 1970s, the promotion of human rights became a valid understanding of national interest for many states, Mexico’s compliance to it was never addressed in facts (Keck and Sikkink, 1998). Indeed, if radicalized populations were not perceived as vulnerable or innocent then, Calderon’s official narrative of human lives during his Drug War is similar, when he claimed that 90% were killings of cartel members (Ramos and Gomez, 2010). In the name of public security, human rights are often violated and justified because the targets are allegedly6 criminals. In relation to the shield of data, the Interdisciplinary Group of Independent Experts (Grupo Interdisciplinario de Expertos Independientes, 2017) who were appointed to follow on the Ayotzinapa case, indicate that a policy committed to the right to truth would privilege the opinion of hundreds of thousands of victims over the defence of a legal frame that, in this case, protects perpetrators’ and victims’ identities. The decision to anonymize the information of the Dirty War or any document related to the enforced disappearances or other crimes committed in the past, as well as the impossible requirement of obtaining informed consent from those involved in the documented cases in order to prevent them from being excluded in the Plataforma Memoria y Verdad—a civic and state-run memorial (Ruelas, 2016)—proves that the archive is a source that helps identify narratives and conceptual frameworks of the state, and one from which we can reconstruct fragments of truth (Dorantes, 2018). In this case, it would seem that the state desires to conserve itself through safekeeping the archives. One of the recommendations that Article 19 made to the state was to withdraw control from the access to historical information. As for access to the archives from the Dirty War, Article 19 identified Congress as the body that has the ability to oblige any public servant to give account if he or she is obstructing the free flow of information (2017), a message that has long gone unheard. Therefore, the archive in possession of the state is also worked on under a logic of conservation because it is linked to this formalistic conception. This helps to understand national history as identity that is crafted and maintained through the controlling actions of the archives. While there is no doubt that collective memory is institutionalized through the archives, fueling certain notions and meanings through its practices, mediations and reproductions, the way in which the past is dealt with is relevant precisely because it refers to a moment in time when facts should have been clarified in order to understand the present as a form of repeated atrocities. Rigney (2012) points out how memories of history are artificial and impersonal, as well as nation-oriented. If one faces gaps in history, it is done from the top-down process of creating memory that the nation, as the framework of collective memory, traditionally provides. That is to say, the ‘imagined community’, or an imposed shared sense of ‘history’ is fostered by memory institutions such as archives, educational materials, memorials, and museums (Huyssen, 2004). Whereas Anderson notes, memory lies afar from its citizens, because it is the product of ‘an artificial composite dependent on mediation and on the power of media to reach larger territories’ (Anderson, 1999: 617) that reinforces the nation as the customary memory. Consequently, the less mediated the memory is, the less it will be considered as part of collective memory, at least under Halbwach’s notion of collective memory. As for the identity of the state, Couldry (2011) suggests that neoliberal principles have come to take on that role. The synthesis of this new order for social and political organizations is embodied symbolically in the market, replacing governments in global societies. Indeed, and in spite of the ongoing economic crisis that began in 2008, the utilitarian logic remains and has transcended the means of production into a model of political principle for all of society’s organizations and formal powers. In this sense, states in developing countries follow this tendency when it commits to the liberalization of services and public goods, thus undermining its legitimate and more urgent role of fighting inequality and accessibility to justice. Moreover, when I referred previously to state collusion, it is because the Mexican state follows the logic of accumulation, which includes the link between legal and illegal, private and public, through a micropolitics of terror that targets any actor that impedes this. These actions, disguised as national (or private security), are the latest expression of the Mexican state’s identity as a form of neoliberal governmentality, a term used by Calveiro (2018) where disappearances and enforced disappearances are the catastrophic outcome of such practices. Therefore, it is not a matter of collusion between a few state actors with criminals alone, nor one of impunity, but the very model of growth that the state follows which also pushes violence in certain regions. To put it in other terms, we do not find censorship through the usage of government publicity alone, nor through the denial to truth in the historical archives, but rather in the very actions the state has carried out for decades. In 2014, when the Working Group of the UN on Enforced or Involuntary Disappearance referred to the case of Ayotzinapa, they enumerated the state’s actions as proof of their lack of commitment to clarity. Firstly, the investigation, carried out by the Attorney General Office (PGR) began 10 days after the disappearances despite it being crucial to search within 72 hours. Secondly, the state was unable to provide a program or protocol for searching for the disappeared, despite it having a history of enforced disappearance. Thirdly, as there is no genetic national database, the investigation largely depended on a foreign forensic anthropological team. Finally, there is no intelligence unit nor reliable registry of the disappeared because the figures consist of a variety of profiles: missing people, migrants, kidnapped, non-identifiable, and enforced disappearances, among others (CNN, 2014). Indeed, the Ayotzinapa case could have been the perfect opportunity for the government to spearhead a turning point in the rule of law, but the facts speak for themselves. ‘Mexico knows more about how many gallons of oil it imports per day than how many people have disappeared in their country. This goes to show the Mexican state’s priorities’ (ONUDH México, 2014). The struggle of the disappeared is not inscribed in a logic of opposition or a class struggle, nor can it be found in progressive movements against conservatives, or in the left or right-winged ideologies. Its coordinates are more related to justice, the restoration of peace, and the search for truth. The problems it embodies are transversal and touch every social sphere. Through the years, the state has had other opportunities to repay their debt in regard to clarifying the abuses of the past, but not without controversies. For example, the aforementioned law on enforced disappearance, known as the General Law in Enforced Disappearance Matter and Disappearances by Particulars, facilitates the creation of a national system to search for the disappeared, and a national commission for searching. It takes into consideration the need for a citizen-led committee and a national registry of the disappeared and the not found. But approved shortly before the end of 2017, it still faces many limitations, including the budget assignation, which is insufficient, and the fact that the national commission for searching depends on the Commission for National Security instead of the Secretariat of the Interior (SEGOB), as previously agreed. A failure by any definition, the Commission for National Security has gained no trust from the collectives that have pushed the law, and would limit their budget and autonomy due to this subordination. Lastly, the state sends mixed signals with its current legal framework. For example, the General Law of Victims (2013) has also recently been approved, but faces similar challenges since it lacks the funds required to function. Pushed by the Movement for Peace with Justice and Dignity during Calderón’s mandate, the platform had at its priority the promotion of a law for the victims and the need for integral reparation measures. However, once it became a reality during Peña Nieto’s administration, it was clear that the platform required urgent reforms that were approved in January 2017. But by November of that same year, a law on internal security was approved as well, providing more power to the already militarized security forces. This law feeds into a wider crisis of human rights, especially for civilians who are the primary victims in the War on Drugs, as can be seen with the cases of Tlatlaya (2014), Apatzingán (2015), and Tanhuato (2015)—all extrajudicial killings. These major abuses of human rights are illustrative of the materializing threat the Mexican population faces with the military in the streets, as well as with the corresponding cover-up by the state. When targeting an audience for unification, as Jodelet’s (1993) idea of mass media memory explains, alternative journalism offers the following perspective. As exposed before, alternative media is understood as critical media that ideally has marketable means to gain visibility (Fuch and Sandoval, 2009). But this is in order to avoid small-scale participatory media that tends to fragment public sphere (Habermas, 1991), something that Fuch and Sandoval attribute to the misconception that all alternative media must sidestep commercial financing. However, as part of the capitalist system, financial resources are required for production and distribution, even if the Internet reduces the costs and enables a more interactive participation. Unless these media organizations have very local driven interests, journalists wishing to reach emancipatory goals through alternative media must try to have sufficient resources for gaining more visibility in addressing the structural inequalities of capitalism, which in return translate to reaching wider audiences (Fuch and Sandoval, 2009: 143–5). A way to address this is not necessarily a market-driven enterprise. For example, a sociopolitical crisis can lead to combining information demands with high quality journalism, which is what alternative journalism did. Therefore, when I mention preservation, I am referring to the appropriation and the will to keep alive a particular content in terms of legacy, in this case, to narratives of action from collectives who search for their disappeared. The media portals I refer to as having this commitment, are, among others, Periodistas de a Pie, Animal Político, Ríodoce, Más de 131, Sin Embargo, Desinformémonos, RompeViento, Somos el Medio, and Aristegui Noticias 7 with the final one ranked as the most popular news portal in Mexico in 2017 and 2018 (Newman, Fletcher, Kalogeropoulos, Levy and Nielsen, 2018). All these portals were able to identify an information demand slot missing on commercial media that nonetheless was crucial. In return, reporting on these stories provided their identity and consolidation because it contributed to raise investigative journalism. There are two features to this: the distribution is on a smaller scale, and such reporting is carried out with the goal of broadcasting and distributing content immediately. This differs from reporting a testimony of the historical past. In tune with Jodelet, communication scenarios modify our frameworks of memory; in this sense, the mass catastrophe currently underway in Mexico is shaping collective memories around the disappeared by communicating this process without the traditional time/space span of commemorating or contesting, because the news stories circulate while the situation is evolving: The long process required for mass memory to be created is over, and instead, humanizing the subject who’s also a victim, and enhancing his or her agency is now carried out from the very beginning, unlike classical memory formations that were constructed over long periods of time. As mentioned, the news organizations listed above emerged during the War on Drugs, and they ensure accessibility to content in order to share it through stories, web documentaries, hybrid websites, interactive infographics, special editions, forms of memorials and investigative work so as to give continuity to cases of the disappeared. They strive to fill the gaps left out by the lack of investigation and truth-seeking of authorities. Though most media platforms I refer to may not have the expressive interest in keeping a particular memory alive, nor do they work collectively, their journalistic practices do refer to civic agency through the acknowledgment of commemorating social performance in a historical context of violence. Preservation comes into play when we consider the usage of media content as an archive, but not under a form of conservation as the state ensures—which is linked to power and identity control—but rather as ‘second-order memory that preserves what has been forgotten’ (Assmann, 2008: 106). The notion of preservation refers to a civic form of memory mediated by informal circuits that keep valuable content available to the public. Instead of focusing on victimhood as the source of subject identity that memory studies classically refer to, the stress here lies in resistance through stories of action that remain online. The subjects depicted are the collectives searching for their disappeared and the news coverage that focuses on their daily battles in the search for truth and justice. When referring to communicative acts that pursue such a quest, I consider them as emancipatory, not just because they have the freedom to express content on their own terms, but because they are projects that have pushed the limits of the making of news itself. By creating alternative spaces of communication, these kinds of acts promote other spaces alien to social norms and legislations (Milan and Hintz, 2013; as cited in Milan, 2015); they are in fact going beyond their informative function because they revive local content and independent producers and voices, but more importantly, they pursue ‘the escalating cultural and mediatic censorship of imagination’, (Milan, 2013: 3; as cited in Milan, 2015). Therefore, to understand these emancipatory communication practices, it is worth noting that they follow a two-way process: they are emancipatory as a form of structural reform at both the production level of news (Milan, 2015), and at individual and collective levels by emancipating actors, either by becoming a meeting place of training and reflection, as the collective Periodistas de a Pie has become, or by exemplifying inspirational work, casting the subjects of their journalism as representatives of agency. The outcome of this process is also emancipatory when they provide quality work, thus promoting the freedom of expression, the right to information and the right to truth. Strictly speaking, the work of journalists is seldom tied to memory; record-keeping is the task of historians. But given the nature of the past as a variation across time and technology, journalism could be considered within the framework of collective memory, too (Zelizer, 2008). Even if the commitment that journalism may have to the past is unclear, and the constant flow of news reshapes the present—including the mediation of the organizations’ own editorial board—there is no doubt that these news portals divide the memory ownership that has traditionally been attributed to the nation. They produce work that can be regarded as a retention of a moment which plays a coherent role to the contestation of the past, no matter how short-lived this memory may be (Zelizer, 2008). That is why these news portals are important. Unlike traditional broadcast platforms, their notion of relevance and pertinence is essentially different. They follow a pattern of continuity in their themes instead of consuming content in an ephemeral display. This continuity, though very different from the logic of commercial news organizations of exploiting freshly generated news, constitutes a form of preservation of pending topics aligned with the paradox of democracy and its prevailing impunity. It is an open documentation that remains online as a reminder of their unsolved state. The content of these pending topics is referred to explicitly in the news and their brother portals that are advertised on the site which ultimately lead to award-winning works, NGOs, and other links mediating information related to the crisis, such as reports. In this respect, their interest in keeping the users engaged also reveals a profile of agency by promoting participation, access, and by sharing related content as well as inviting users to their activities while promoting like-minded third parties. Unlike the reasoning of conservation that the state manufactures through its memory institutions, these portals serve as ready-to-use, accessible consultations of documents and reports that sustain the news they create. Therefore, the opportunities digital media offers lie within the tangled tension of claiming space to the digital versions of traditional media outlets such as Milenio.com, El Universal Online, Reforma.com, or Noticieros Televisa.com (Guerrero, 2016). But this tension is also present when keeping the space open for public participation, and in maintaining in circulation the state of impunity prevailing for each case of violence in the War on Drugs. What must be also highlighted is that these alternative portals stress, over the permanence of special reports or investigative work, the debt the state has to historical subjects. It is in this respect that some news portals which recently emerged are linked to social movements and a framework of safekeeping a collective memory. This is seen in the cases of Desinformémonos or Somos el Medio, which are both inspired by the Zapatistas or the autonomous indigenous communities of Guerrero. I will refer to the case of Periodistas de a Pie (n.y.), a collective of independent journalists. Seeking to be socially useful, their selection of themes puts the citizen at the center. Their powerful photography features common people on the front cover, resembling a human rights portal. The chosen narrative potrays civilians in two ways—on the one hand, they are victims of inequity and violence due to the War on Drugs; on the other, they are protagonists of change. News feeds strongly from the testimonies of those displaced due to violence including community leaders, collectives searching for their disappeared, migrants, social workers, and victims of violence, among others. Therefore it is within Periodistas de a Pie’s permeability with regard to social concerns that their ability to identify the victim’s relevance as an actor of current change in Mexico lies; this grants the victim a form of citizenship fostered by surviving state or non-state actors’ violence. They give their accounts on civilians who are doing what the state should be doing. The way in which Periodistas de a Pie elaborate on the remembrance surrounding the search for the disappeared is by creating high quality investigative journalism. It is an indirect form of campaigning as it creates work of iconic potential. As seen on the first section, online media has not escaped from the commodification of information or the dependency of finance from political actors. Yet one of the features of this news portal is the diversification of sources by providing high standard journalism, especially when it addresses what other news portals do not. In this regard, Periodistas de a Pie has the explicit aim to provide a human rights approach to news. This is a key element that distinguishes alternative media from commercial media. It offers critical content where victims of violence are participants of news not only by providing their testimony alone, but by making visible their struggle which is of social and geopolitical concern. One example is collaborators Daniela Rea and Alberto Najar’s award-winning En El Camino, a microsite that covers the routes of migration, from Central America to the US. According to Periodistas de a Pie member Ramirez (Gorostieta, 2016), the published material is the result of fellow journalists of the collective and other reporters that are locally based along the route, hoping to be given space to their reports that, for security reasons, have been turned down by other media. After some years, the microsite has created a demand for financing regional journalism. Another example is Pie de Pagina, a website where due to its relevance in human right topics, finance has been be obtained to do a full coverage of certain stories that were previously rejected by the editorial committee. A second method for remembrance is linked to the idea exposed previously. Periodistas de a Pie achieved a strategy of scaling the issue through recognition. Their web documentary series, Buscadores en un país de desaparecidos, earned them the prestigious Gabriel García Marquez Prize in 2017. En El Camino was recognized by the United Nations with a report by journalist Angeles Mariscal on her work on migrant women of Central America as victims of human trafficking in the border of Chiapas. For her work, Daniela Rea was awarded the Breach-Valdez Award in 2018. As with most types of credit, these are all forms of institutionalization and canonization that help a memory travel (Erll, 2014). Likewise, this is also true for La libertad del diablo (2017), the highly acclaimed, award-winning documentary on victims and perpetrators of violence by director Everardo González, which also features Daniela Rea. Writer Enrique Osorno is correspondingly part of the rewarded work. The circulation of their work in festivals opens up the topic to other types of audiences, for example, by escalating the work from a local to an international scene. There are two more actions that enable Periodistas de a Pie to distribute their work and impact the preservation of social performance to contest forgetting. Their offices serve as a multipurpose learning center, holding workshops, seminars, and special training courses to allow exchange with experts for professionalizing journalism and linking it to human rights. The presence of civilians and reporters learning together runs parallel to their activities of diffusion on the portal, as well as on their Facebook and Twitter accounts, thus creating a network of local citizens and media professionals whose reflection and usage of the digital and national emergency becomes a press source. They reinforce the usage of digital tools and the promotion of alternative forms of media for investigating, but also for building bonds and fostering support—a human dimension that is alien in most commercial news organizations. Thus, they are becoming an important point of happenstance for manufacturing news and social action. Solidarity is also an uncommon feature in the world of journalism. However, Periodistas de a Pie have joined forces with national and international networks. They are part of the Global Investigative Journalism Network and of Redes de Periodistas in Juárez, Red Libre Periodismo de Chihuahua, and have presence in the state of Guerrero. Currently, they’ve expanded their networks to other independent media across Mexico. These are strategic ties to access and broadcast local news production, but also a way to guarantee protection against aggressions, which in 2017 reached 507 registers, with 12 journalists murdered and 24 disappeared. A total of 1,986 aggressions have been counted during Peña Nieto’s mandate (Artículo 19, 2018), and eight media-related workers have been killed in 2018. Two decades ago, it was the nation, through its memory institutions, that had the means to mediate memory. Today, the more our mediations rely on platform networks, the more content is likely to be created and preserved by many, which has led to the global scenario of communication in which voices of agents outside of the state are also heard. With the example of Periodistas de a Pie, alternative journalism provides tools and the framework for a reading of what public space is, as well as what the national emergency has meant in terms of citizenship. By researching the topics of the disappeared, they are assuming that their news portal is a space for convergence and memory. Periodistas de a Pie gives an account of a social performance alien to state participation. This is opposed to the logic of opacity that the state has performed for decades. By controlling the AGN documents, and by subordinating the commercial press, the state has been covered until very recently, having maintained a conservationist approach to history. I would like to finalize by quoting Todorov’s (n.d.) own conception of how the past can be reworked. A moral appropriation of a memory can only be achieved if one can go beyond the logic of victims and perpetrators. What’s more, it must impose justice beyond singular cases. Any form of communication that serves emancipatory practices must bear in mind that, regardless of the collective memory it identifies itself with, ‘the good use of memory is the one that helps a just cause, and not the one that conforms to not repeating the past’. 1Canal seisdejulio (1988) is probably one of the first examples of alternative media in Mexico that focused on democratization. It documented practices ranging from institution-oriented projects to revolutionary ones. It emerged prior to the technological convergence of analogue and digital content. 2It was precisely their usage of media that helped to protect them against repression. 3In the same vein, I will not cover the allegation of technology as a form of cultural homogenization and how it plays into a continuation of imperialism in the global age, including the perpetuation of technological dependence in less wealthy nations. Nor will I explore the critical studies of media theory that places the Internet as the latest arena for exploitation. The reason for this is because it is not within the scope of this text. For a review in this regard, see Fuch, C, Dean, J, or Aouragh, M and Chakravartty, P.
4Set in the mid-1950s in Algeria, the author gives an account of how the Algerian National Liberation Front (FLN) took over the radio by broadcasting The Voice of Fighting Algeria, and how a communication channel of the colonizer was transformed to serve for the purpose of liberation. But Fanon’s example goes beyond this subversion usage. What is insightful is the creative and social outcome. He assures that whenever the broadcast was interrupted or made inaudible, listeners that gathered around to tune would explain the narrative in their own terms, partly recreating events based on facts, but also by re-elaborating on it with a mixture of consent, aspiration and faith. This made them participants in the struggle whilst compensating for the lack of a signal. Thus, in spite of the censorship or the technological flaws, radio listeners were suddenly encouraged to address the revolution in a moment of impasse. 5As part of the 50th Anniversary of the student repression of October 2nd in 1968, a collection of archives known as M68 became public in September 2018 by order of the National Institute of Transparency, Access to Information and Personal Data Protection (INAI). However to this day the legal restrictions to protect personal data in other cases of state repression remains, as for example, the archives documenting the Dirty War. 6While many human lives are lost during security operations, their participation in crime cannot be taken for granted when it has been thoroughly documented that only 4.5% of crimes are fully investigated. See Zepeda, G., and the scene of crime is sometimes altered or official sources provide information that is false to justify state violence, as in the cases of Tlatlaya (June 2014), Iguala (September 2014), Apatzingan (January 2015) and Tanhuato (May 2015). Moreover, many involved in the Dirty War in Guerrero and the current Drug War are extreme examples of structural inequality. In the first case, though the drive was ideological, the armed conflict broke out after the population demands went unheard and criminalized for years, via democratic venues. In the second case, the Drug War has an economical drive because marginalized civilians, including teenagers and children, found social mobility in organized crime, or many may have had no choice but to join the bands. See Anaya, A. Other people affected during security operations are civilians who might be caught in the crossfire. Therefore sometimes, state security operations have paradoxically come to aggravate populations instead of protecting them. 7Due to its success, Aristegui Noticias can be considered as one of the main news organizations even if it is widely regarded in the Mexican press as independent, which is to say not a participant in commercial media in the traditional sense as explained in this article. However, if one follows Fuch’s notion of ideal alternative media (2009), this could also be an example to a certain extent. The portal offers critical content by promoting a progressive discourse to news and breaks the mode that all commercial media is aligned to the state. It holds a healthy equilibrium by voicing official and civil society positions, but maintains an interest in professionalization over participatory practices, which separates it from alternative media. Indeed, Aristegui Noticias is a rare example of prosperous, top quality, commercial journalism of editorial and commercial independency. The author is part of the project, ‘We are all Ayotzinapa: The role of Digital Media in the Shaping of Transnational Memories on Disappearance’. This project has received funding from the European Research Council (ERC) under the European Union’s Horizon 2020 Research and Innovation Programme (grant agreement n°677955). Anaya, A 2013 A Non-state Actors as Violators in Mexico. A hard case for Global Human Rights Norms. In: Brysk, A (Ed. ), The Politics of the Globalization of Law. Getting from Rights to Justice, pp. 180–198. New York: Routledge. Artículo 19 2018 El derecho a la verdad desde los archivos. Animal Político, 27 March. Available at: https://www.animalpolitico.com/blogueros-altoparlante/2017/03/27/derecho-la-verdad-desde-los-archivos/ [Last accessed 26 July 2018]. Artículo 19 Oficina para México y Centroamérica 2016 Libertades en Resistencia. Available at: https://articulo19.org/wp-content/uploads/2017/04/Libertades-en-Resistencia_Informe-2016-A19.pdf [Last accessed October 25 2018]. Artículo 19 Oficina para México y Centroamérica 2018 Democracia simulada. Nada que aplaudir. Available at: https://articulo19.org/nadaqueaplaudir/ [Last accessed July 26 2018]. Assmann, A 2008 Canon and Archive. In: Erll, A and Nunning, A (Eds. ), Media and Cultural Memory/Meiden und kulturelle Erinnerung. An International Interdisciplinary Handbook. Berlin: Walter de Gruyter. Available at: http://www.let.leidenuniv.nl/pdf/geschiedenis/cultural%20memory.pdf [Last accessed 13 November 2018]. Calveiro, P 2018 Desapariciones: de la llamada Guerra Sucia a Ayotzinapa. Cartografias criticas, 1. Los Angeles, CA: Ediciones Karpa. Available at: http://www.calstatela.edu/al/karpa/p-calveiro [Last accessed 26 July 2018]. Couldry, N 2011 Why Voice Matters. Culture and Politics After Neoliberalism. London: Sage. Dorantes, C 2018 Resguardo y difusión de archivos en museos de memoria. Animal Politico, 19 January. Available at: https://www.animalpolitico.com/blogueros-altoparlante/2018/01/19/difusion-archivos-memoria/ [Last accessed 26 July 2018]. Erll, A and Nunning, A (Eds.) 2014 Transnational Memory/Media and Cultural Memory. Medien und kulturelle Erinnerung. An International Interdisciplinary Handbook. Berlin: Walter de Gruyter. Available at: https://warwick.ac.uk/fac/cross_fac/ehrc/events/memory/rigney_transnational_memory.pdf [Last accessed 26 July 2018]. Fanon, F 1965 A Dying Colonialism. Available at: http://abahlali.org/wp-content/uploads/2011/04/Frantz-Fanon-A-Dying-Colonialism.pdf [Last accessed 29 August 2018]. Gibler, J 2017 Interviewed by Navarro, F, 24 October. González, P 1965 La democracia en México. México D.F. : Era. Gorostieta, A 2016 Periodistas de a Pie por los Derechos Humanos Entrevista a Jade Ramírez Cuevas. Revista Mexicana de Comunicación. Available at: http://mexicanadecomunicacion.com.mx/rmc/2016/10/28/periodistas-de-a-pie-por-los-derechos-humanos/ [Last accessed 13 November 2018]. Grupo Interdisciplinario de Expertos Independientes 2017 Revertir la impunidad. Diagnóstico y propuesta a partir del trabajo del Grupo Interdisciplinario de Expertos Independientes (GIEI) y del Centro de Dererchos Humanos Miguel Augstin Pro Juarez. México: Centro de Derechos Humanos Miguel Agustin Pro Juárez A.C. Available at: https://issuu.com/centroprodh/docs/revertirimpunidad_issuu [Last accessed 25 October 2018]. Guerrero, M 2016 Democracia y Medios en México: El papel del periodismo. Ciudad de México: Instituto Nacional Electoral. Available at: http://biblio.ine.mx/janium/Documentos/cuaderno_34.pdf [Last accessed 26 July 2018]. Gutierrez, B 2015 Ayotzinapa. La expansión global de una causa. Horizontalmx. Available at: https://horizontal.mx/ayotzinapa-la-expansion-global-de-una-causa/ [Last accessed 10 July 2018]. Jodelet, D 1993 The Moral and Affective Side of History. An Example of Collective Memory: The Trial of K. Barbie ‘The Butcher of Lyon’. Pscicología Política, 5(6): 53–72. Available at: https://www.academia.edu/36236804/Jodelet_D._1993_._The_Moral_and_Affective_Side_of_History._An_Example_of_Collective_Memory_The_Trial_of_K._Barbie_The_Butcher_of_Lyon_._Psicologia_Politica_5_6_53-72 [Last accessed 12 July 2018]. Keck, M and Sikkink, K 1998 Activists beyond borders. Advocacy networks in International Politics. Ithaca: Cornell University Press. López, L 2017 Movilizaciones por los Desaparecidos en México. Pleyers, G and Garza, M (Coord. ), México en movimientos resistencias y alternativas. México: Miguel Ángel Porrúa. Lorot, A 2018 Interviewed by Navarro, F, 7 April. Martínez, P 2017 Interviewed by Navarro, F, 14 December. Milan, S 2015 Liberated Technology: Inside Emancipatory Communication Activism. Available at: https://www.academia.edu/20076132/Liberated_technology_Inside_emancipatory_communication_activism [Last accessed 26 July 2018]. Newman, N, Fletcher, R, Kalogeropoulos, D, Levy, D and Nielsen, K 2018 Reuters Institute Digital News Report 2018. Reuters Institute for the Study of Journalism. Available at: https://es.scribd.com/document/382529651/Dnr-2018-Final-Web#from_embed [Last accessed 26 July 2018]. ONUDH México 2014 México sin un plan para buscar a los desaparecidos: Ariel Dulitzky en CNN, 14 November. Available at: https://www.youtube.com/watch?v=lmju7LBptdQ [Last accessed 17 April 2018]. Pastrana, D 2018 La oportunidad para el periodismo crítico. Periodistas de a Pie, 3 February. Available at: http://www.periodistasdeapie.org.mx/editorial-52-2018-la-oportunidad-para-el-periodismo-critico.php [Last accessed 17 April 2018]. Periodistas de a Pie (n.y.) Available at: http://www.periodistasdeapie.org.mx [Last accessed 21 October 2018]. Pie de Página (n.y.) Available at: https://piedepagina.mx [Last accessed 21 October 2018]. Quintana, J 2017 Interviewed by Navarro, F, 4 December. Ramos, J and Gomez, R 2010 “Muerte de civiles enfrenta a poderes”. El Universal, Seccion Nacional, 17 April. Available at: http://archivo.eluniversal.com.mx/nacion/177082.html [Last accessed October 16 2018]. Reséndiz, F 2018 CNDH hace mal balance del sexenio de EPN. El Universal, 29 March. Available at: http://www.eluniversal.com.mx/nacion/politica/cndh-hace-mal-balance-del-sexenio-de-epn [Last accessed 17 April 2018]. Rigney, A 2012 Transforming Memory and the European Project. New Literary History, 43(4): 607–28. Baltimore, MD: Johns Hopkins University Press. Available at: https://muse.jhu.edu/article/497937 [Last accessed 26 July 2018]. Ruelas, A 2016 Discurso de Ana Ruelas durante la presentación de la plataforma #MemoriayVerdad. Available at: https://articulo19.org/wp-content/uploads/2016/10/Discurso-03.jpg [Last accessed 16 April 2018]. Todorov, T (n.y.) Los dilemas de la memoria. Cátedra Latinoamericana Julio Cortázar. Available at: http://www.jcortazar.udg.mx/sites/default/files/TODOROV.pdf [Last accessed 26 July 2018]. Yankelevich, J 2017 Desde y Frente al Estado. Pensar, atender y resistir la desaparición de personas en México. Ciudad de México: Centro de Estudios Constitucionales SCJN. Zelizer, B 2008 Journalism’s Memory Work. In: Erll, A and Nunning, A (Eds. ), Media and Cultural Memory/Meiden und kulturelle Erinnerung. An International Interdisciplinary Handbook. Berlin: Walter de Gruyter. Available at: http://www.let.leidenuniv.nl/pdf/geschiedenis/cultural%20memory.pdf [Last accessed 13 November 2018]. Zepeda Lecuona, G 2003 La Investigación de los Delitos y la Subversión de los Principios del Subsistema Penal en México. UC San Diego: Center for U.S.-Mexican Studies. Available at: https://escholarship.org/uc/item/9wq0x96k [Last accessed October 16 2018].